7SY - Black monochrome frame with 'Fendi stripe' at temple and graduated lenses. The sunglasses are beautifully crafted from the finest acetates and metals. 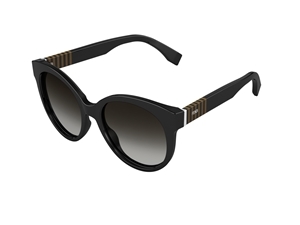 Each Fendi FF 0013 sunglass comes with its own branded case, cloth and packaging, and covered by the 12 month no quibble sendoptics guarantee.